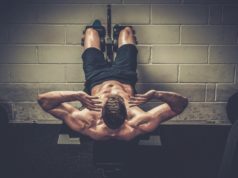 CRUNCHES AND SITUPS are one path to ripped abs, but if you have lower-back pain (or they just don’t work for you) you need to use an alternate route. Stability exercises, during which your core works to prevent movement rather than initiate it, can tighten your midsection without aggravating any lumbar injuries. Directions: Perform the routine up to four times per week—you can do it at the end of another workout or on its own day. The exercises are done as a circuit. Perform reps of each move (or static holds, where noted) continuously for 45 seconds. Afterward, rest 60 seconds. Repeat three times or until 20 minutes have passed. 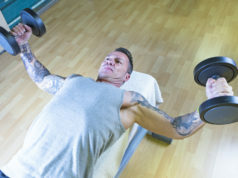 Try to improve your number of reps each week. Use an abs wheel, or slide a lightweight plate on each end of a barbell and affix collars. Kneel on the floor and hold the wheel right below your shoulders. Brace your abs and roll forward until you feel your lower back is going to sag. Roll back so the wheel is under your shoulders. Lie on your right side. Now prop yourself up on your right forearm and straighten your body so your weight rests on the forearm and the outside of your right foot. Hold the position for 45 seconds, and then repeat on the left side. Attach a single-grip handle to the pulley of a cable station, and hold it with both hands. Stand away from the machine so there is tension on the cable and you have to resist its pull to one side. Press the handle in front of you so your arms are extended. After 45 seconds, repeat on the opposite side. Next articleWhy do my lungs burn after I run in the cold? Men’s Fitness is a leading source of information, from Mzanzi and around the globe, on fitness, training, health & nutrition, adventure, high profile athletes, fashion, lifestyle tips, expert advice and much more.